December | 2013 | Woxford Brewing Co.
I’ve been fan of Rye IPAs for some time. My first love was Jester King’s Wytchmaker. Initially this beer was a straight-forward American IPA with a nice dose of Rye, solid American Hops and Dry-English-Ale yeast. Over time, Jester King evolved their beer by slowly modifying the fermentation to include local wild yeast and blending in some amount of older sour beer. 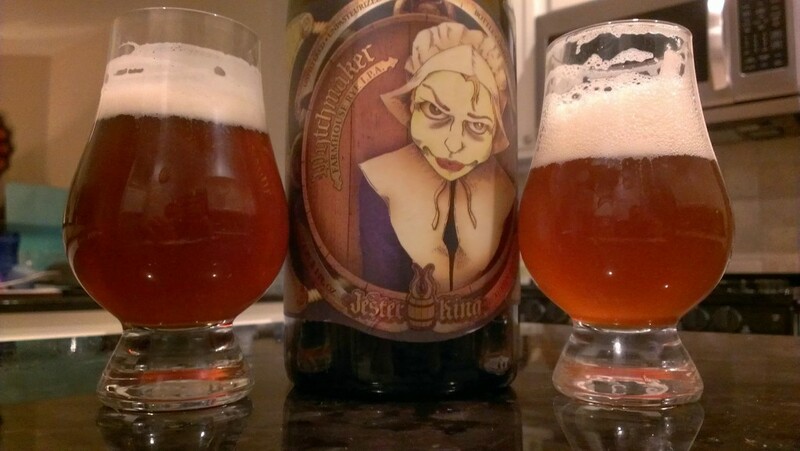 I’ve enjoyed tasting this beer as Jester King has made these changes. Last summer I was pleasantly surprised to encounter a rather prominent change. With the introduction of Brett, there is a huge impact in the nose of the beer; clearly for the better. In November, I attended an AHA Rally at Jester King Craft Brewery and I spent some time chatting with Jeff Stuffings. One of the complements I shared was how well the Brett complimented Wytchmaker. Jeff chuckled a bit and said that they’ve been adding Brett since June this year, but I was the first person to have noticed the change. I didn’t seem possible NOT to recognize this massive change in aroma. With that situation in mind, I decided to brew the two versions of this beer and experiment with a third. The recipe is a 12 gallon batch which I’ll split into three 4 gallon batches. 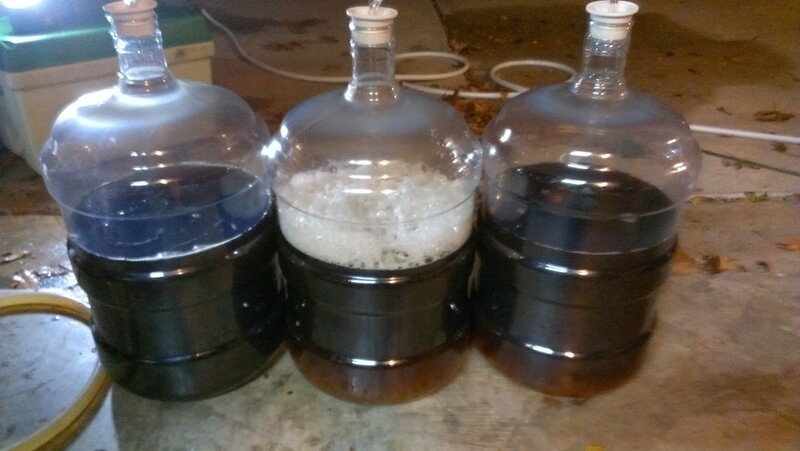 One carboy will be fermented with White Labs Dry English Ale (WLP007) like the original. The second with Wyeast French Saison (3711) and then aged with Brett B. in secondary to come close to the current release of Wytchmaker. The third will be fermented with Brett B. Trois as an experiment with 100% Brett fermented beers. 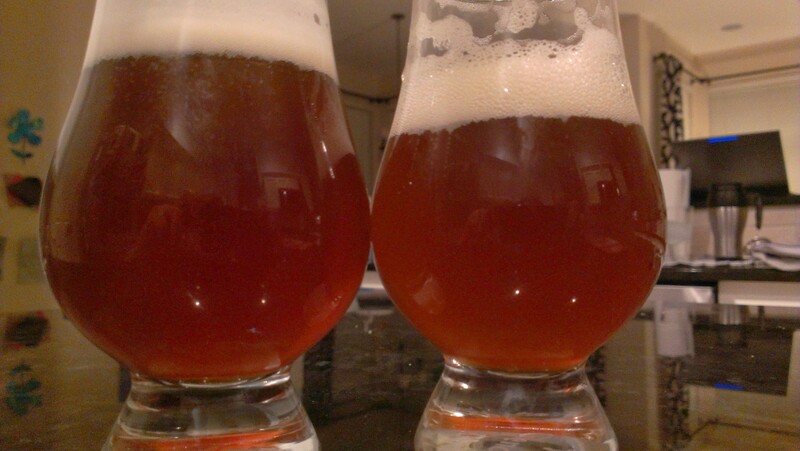 Dry-English-Ale (007) on the left, 100% Brett B. Trois on the right. I’ve now kegged two of the three batches. The Dry English Ale yeast finished first, but for some reason this time it threw off a ton of diacetyl. 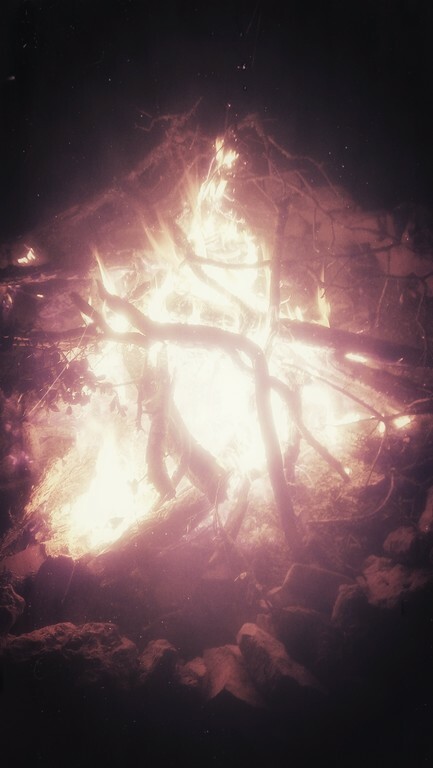 So much then I knew I needed to do something. I was stepping up some Wyeast 1056 yeast for ardeo, so I decided I would pitch some active 1056 (kruasening) to clean it up. This restarted fermentation in the beer and when I dry-hopped, I didn’t pick up any more diacetyl, though I didn’t perform a complete test. Terminal gravity was 1.013. Next finished was the 100% Brett Trois fermentation. F.G was 1.010. The amount of tropical fruits coming out was intense, so much that I almost didn’t dry-hop, but part of reason for brewing this recipe was to finish off some hops. The 3711 version fermented down to 1.006 and at this point I pitched Brett Brux and dry-hopped the beer. It’s still aging another 4 weeks to bring out the Brett B. character, and then it’ll be bottled and aged for 6 weeks before tasting. Aroma — Huge hop nose, some citrus, a little pine. Some malt in the nose. A faint hint of caramel… most likely remnants of diacetyl; present but not offensive. Appearance — Amber color. Slight cloudiness that comes from a heavy dry-hop. Slightly off-white head, creamy texture. Quite a bit darker than the current Jester King Wytchmaker color; most likely due to different kettle malliard reactions during the 90 minute boil. Taste — Sharp rye spicy bite, followed by malt sweetness, fading into a lingering hop bitterness. Hop flavors and presence help balance the higher gravity finish. Mouthfeel — Medium body. Not chewy, but but not thin. Hard to tell if there is a dry finish because of the hops covering much of the lingering flavors. Notes — Solid Rye IPA, though slightly marred by the diacetyl presence. Hard to beat this recipe when done flawlessly. Aroma — Tropical fruits, sweet malt, mango, bananna, touch of bubblegum. Appearance — Amber color, just a bit lighter than the 007 version. Same slight cloudiness from the dry-hop; possibly will clear up in keg, other Brett beers have become brilliantly crystal. Same off-white head, a bit more fluffy and foamy. Lingers and leaves lovely lacing on the glass. Taste — Similar sharp rye bite and then a bit of a belgian yeast spiciness, followed by sweet malt, melding together and then absolutely crushed with a huge hop bitter finish, lingering for quite some time. Mouthfeel — Medium to light body; definitely lighter than the 007 version. Specific Gravity backs that up, though only by 3 points or so. Over time, it’s possible the brett might drop down a notch or two. Notes — It appears the brett “ate” lots of the hop aromas. WIth the amount of dry-hop added, I should be able to pick out the Simcoe, Cascade, and Centennial, but it seems to sit behind the yeast aromas. I also bottled a case of this beer to see how it evolves in the bottle. Homebrewers face many problems in the quest to making great beer consistently. There are many more than 99 of these problems. A reoccurring problem that I face is an over-abundance of hops; mostly because of my lupulust. I really enjoying buying ingredients in homebrew-scale bulk. I also cringe when buying some of these ingredients at the local home brew store (LHBS) simply because the markup over the bulk purchase is sometimes quite astounding. I’m not here to criticize the business model; rather I work around it with bulk purchases. However, this can present a separate problem. I recently updated my inventory of hops and was a bit shocked to tally up the total. Roughly 18 pounds of frozen hops, from crop years 2010 through 2013. So far, i’ve not encountered any freshness issues due to the quality packaging from today’s homebrew supply vendors. Certainly there will be Alpha Acid degradation, but that’s less of a concern for homebrewers who aren’t attempting to rebrew the exact same beer from batch to batch. To address this “problem”, I’ve been reorganizing my brew schedule and recipes. I’m currently pushing all of my hop-heavy recipes (IPAs yay!) up sooner. And I’ve also adjusted some existing recipes to be hopbursted instead so I can make use additional hops. It was in this climate that this recipe was born. Fancy new hop?, check (Mosaic). Highly-prized and hard-to-find hop, check (Nelson). Name-brand hop, check (Simcoe®). Hop-bursting?, check. Using 3/4# of hops in a 6 gallon batch?, check.